I have an old domain registered with GoDaddy. Let's say it's olddomain.com. I want olddomain.com and www.olddomain.com to go to www.newdomain.com. The complication is that I have a few subdomains setup using GoDaddy's DNS manager and A records that I do not want affected. If I use the settings below, will it affect the subdomains? I had another domain which only had one subdomain on it, so I used it as a test. Setting up the redirect did not affect my existing subdomains (A records). 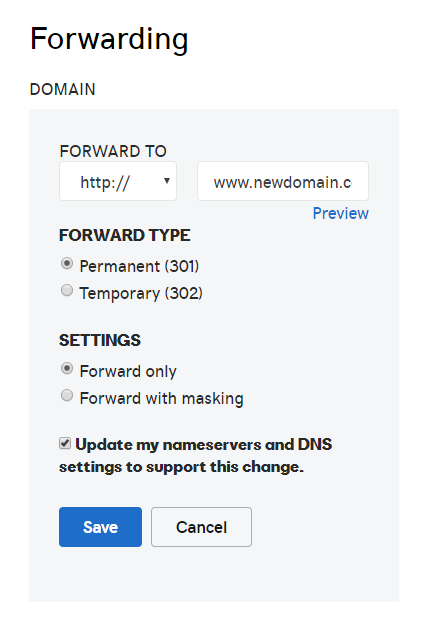 Update: checking the "Update my nameservers and DNS settings to support this change." box deletes the www CNAME entry which means that only http://olddomain.com will forward/redirect. http://www.olddomain.com results in a DNS error! Our CEO had a link to www.olddomain.com in his email signature. Luckily I clicked on it today to test it after forwarding all our domains. I had to add CNAME entries back to every domain. Not the answer you're looking for? Browse other questions tagged 301-redirect godaddy domain-forwarding or ask your own question. Difference between forwarding and redirecting in GoDaddy? Will my domain setup (GoDaddy) work with Github pages CDN?